Video demo 1: Anatoly Kusyakov. Spring Visions. Suite No. 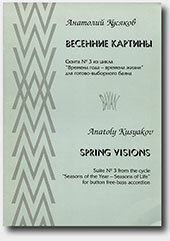 3 from the cylce "Seasons of the Year - Seasons of life". Performed by Yury Shishkin, bayan (accordion) at the concert in St.Petersburg. (Attention! The piece starts at 07 min. 22 sec. and ends at 21 min. 50 sec.). Video demo 2: Anatoly Kusyakov. Spring Visions. Suite No. 3 from the cylce "Seasons of the Year - Seasons of life". Performed by Yury Shishkin, bayan (accordion) at the concert in Kryvy Rig (2001). (Attention! The piece starts at 05 min. 02 sec. and ends at 19 min. 50 sec.). Video demo: Anatoly Kusyakov. Spring Visions. Suite No. 3 from the cylce "Seasons of the Year - Seasons of life" Parts 4, 5, 6. Performed by Kulisic Bosiljka, bayan (accordion).